Here we are right in the north of the Lothingland peninsula, but unlike the churches of its neighbours in the dreary suburbia of Yarmouth, Burgh Castle's church is in an idyllic setting not far from the banks of the wide, rolling Waveney, where it widens out into Breydon Water. Burgh (pronounced Burra) Castle is on the Suffolk side of the river, and in fact this parish was in Suffolk until 1974 when it was unfortunate enough to be dragged into the northern county along with those churches on the fringes of Yarmouth and Gorleston. 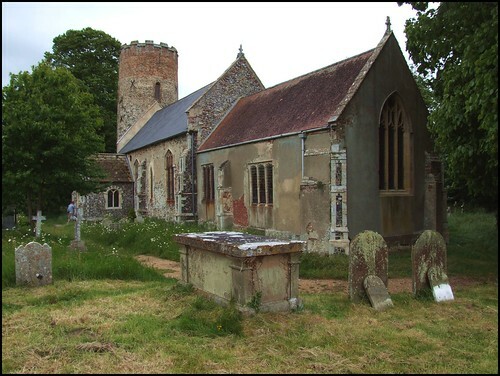 Until then, this was Suffolk's most northerly parish, and All Saints the county's most northerly medieval church. Burgh Castle was one of several Roman forts along the east coast, and in later years it was not uncommon for missionary churches to be built in their ruins - St Cedd's chapel at Bradwell in Essex is well-known, and at Walton Castle, near Felixstowe, St Felix came ashore to build his cathedral church and be proclaimed first Bishop of East Anglia. His Dummoc is now under the sea, but Burgh Castle finds itself further inland than it was fifteen hundred years ago, thanks to the vagaries of the North Sea tides. Burgh Castle was where another East Anglian missionary, St Fursey, based himself. St Fursey is enthusiastically touted by the Anglicans in East Anglia, because unlike that tough, muscular St Felix, Fursey was a more gentle, contemplative man - and, much more importantly, unlike Felix, who came from the Roman church, Fursey was a Celt. This encourages people to think that, in the decades before the Synod of Whitby, East Anglian Christianity was part of the Celtic strand, but really there is no evidence for this. St Felix was an energetic evangeliser, and the Kingdom of East Anglia was pretty well completely Christianised before Fursey arrived on the scene, beginning almost a millennium of intense loyalty to Rome. Fursey seems to have been a favourite of the East Anglian royal family, and although there isn't a lot of evidence that he made much of an impression in comparison with St Felix and particularly St Botolph, who was based about halfway between Burgh Castle and Dummoc at Iken, he's a nice touchstone. His iconography is often confused with that of the more proletarian Norfolk Saint, St Walstan. It may well be that there is a little shrine to St Fursey inside this church, but as we found it locked, and there was no keyholder notice, and the Rector wasn't answering his telephone, I can't tell you. To be honest, my heart sunk when I discovered that Burgh Castle was in a joint benefice with Belton, because although there is nothing to show that it is suffering the same awful neglect as the church there, it doesn't bode well. Still, I'll have another try at getting inside next time I am up that way. Sam Mortlock notes a memorial window claiming to depict two great Christian monarchs of lineal descent though 1000 years apart with images of Queen Victoria and King Alfred, which sounds a hoot. Similar claims were made for Elizabeth I - at Preston in Suffolk, her set of royal arms shows her as being descended from Roman emperors!